It is natural to assume migrants and refugees are coming to the EU because of the NATO wars in Afghanistan, Iraq, Libya, Syria etc. This is certainly correct, but there are interesting reports that will show there is much more to this current mass migration. The level of payments reported for Italy in Part 1 seem high compared other countries. Refugees in Germany receive up to 345 euro per month from the government, while in Sweden the maximum monthly allowance is 224 euro. (3) Nevertheless the cost of this massive wave of migrants is high. In 2016 the German media suggested the total amount the government will have to pay to support migrants is about US$46 billion per year. (4) In January 2017 a paper in the UK estimated the German migrant policy could cost them US$51 billion by the end of 2017. (5) This amounts to about A$65 billion, so is hardly small change. It is well known that the EU governments are demanding Neo-Liberal austerity cuts to public services that are much the same as what we have suffered in Australia. Why would otherwise penny-pinching governments give so much money to people who are not expected to do anything in return for their payments? If anyone does not smell a rat here, they do not understand the mindset of today's Neo-Liberal politicians. 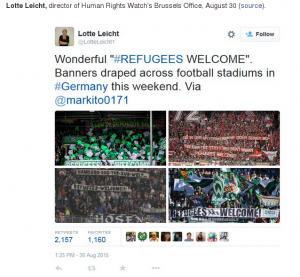 One of the thousands of tweets with "#Refugees" hashtag sent in August & September 2015. WHY END REFUGEE SUPPORT IN TURKEY? This is about US$321 million. When you consider the actual cost of migrants to Germany today – which surely could have been estimated by German bureaucrats in 2014 - you must ask the question: If the Germans or the EU bureaucracy did not want millions of migrants flooding into the EU, why didn't they just pay the very modest cost of feeding them in Turkey? The cost of US$321 million for food is about 0.5% of the current cost of housing migrants in Germany this year. How could the bean-counters overlook this way of saving themselves billions of euros? DID THE EU ALWAYS WELCOME MIGRANTS? 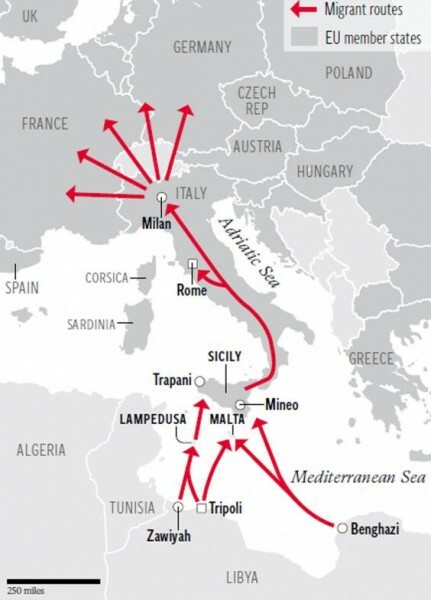 In response to the closing of the land route, migrants began making the voyage from Turkey to Greece by sea. This forced the Hellenic Coast Guard to use “pushback” tactics, repulsing boats away from the Greek coast into Turkish waters. However this practice violates international law and Amnesty International with other NGOs raised the issue in the media. At this point we need to highlight the work of George Soros. He is a politically active billionaire. One of his causes is “open borders” and mass migration. He funded many of the NGOs active in criticizing Greece for its “pushback” tactics. However he also had a political friend in Greek politics, Alexis Tsipras, leader of the political party Syriza. In the next round of elections, Syriza won big, first in European parliament elections in May 2014, and then in Greek parliamentary elections called in January 2015. In this election Syriza was three votes short of a parliamentary majority. This allowed Tsipras, allied with a small center-right party, Independent Greeks (ANEL), to govern. 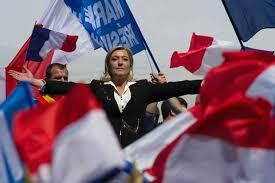 (Ibid) The central issue in these elections was not migrants but the EU “bailout”. Syriza opposed this legalized robbery. (In the end they agreed to the “bailout” in spite of the fact they won the election by opposing it.) As soon as he was in office, Tsipras' government moved to completely change the Greek migrant policy. In its first month, Syriza’s deputy immigration minister announced the government would turn refugee detention facilities into welcome centers. They also discontinud Operation Xenios Zeus, an aggressive policy of identifying and deporting illegal migrants. On April 14, the government declared all Syrian refugees would receive documents for onward travel to Europe. (8) Greece not only welcomed migrants, they gave them valid travel documents for the rest of the EU. Between April and August 2015 arrivals increased 721%, from 13,133 to 107,843. 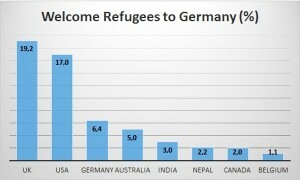 More refugees arrived in July than in all of 2014. HOW DO MIGRANTS PAY FOR THEIR PASSAGE TO GREECE OR ITALY? We have seen that Soros and his political friends like Tsipras worked to encourage increase migration to the EU. We have also seen that Germany wants to encourage migrants to “replace its aging workforce” and/or drive down wages. Here we see that the US is also quietly involved as well. Why would they spend money assisting migrants to enter the EU? WHO GAVE THOUSANDS OF SMARTPHONES TO MIGRANTS? Cisco is American multinational IT company which specializes in networking. Cisco says of its Meraki access points that they “are built from the highest grade components and carefully optimized for a seamless user experience. The outcome: faster connections, greater user capacity, more coverage, and fewer support calls.” In other words, this is a state of the art system which provides “deep network insight enabling smarter network management.”(12) NetHope, a shadowy organization headquartered in CIA-friendly Fairfax County, Virginia, is tied to the US government. Springmann believes one reason the US has to support mass migration is to destabilize Europe as an economic challenger to the US. WHO SENT TWEETS TO MIGRANTS/REFUGEES ON TWITTER? Soros has created an international network of individuals and organizations quietly working together to give the appearance of a “spontaneous” result of the NATO wars in the Middle East. But would this flood of migrants have happened if money was provided to feed and house them in Turkey and other countries? 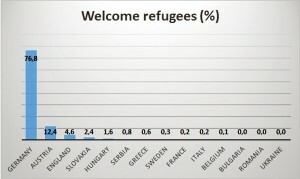 If countries in the EU did not offer allowances to the migrants who are not refugees? If Greece has not suddenly offered migrants valid travel documents? If migrants were not provided with free smartphones and state-of-the-art networking hardware? If NGOs had not handed out guide books in Arabic? If people in the US, UK and Australia had not sent tweets inviting migrants to the EU? The next question is this: What is the purpose of mass migration to the EU and who is behind it? DOES SOROS HAVE THE HIGH MORAL GROUND ON REFUGEES? Many people agree with Soros' advocacy of suppoAre they afraid to speak out against the genocidal wars launched by the US and NATO? rting migrants and refugees. Those who oppose his plans are called “racists”. Consider this: Pro-migrant activists made much of the Greek “pushback” as being against international law, which it is. How many of these pro-migrant activists, including Soros himself, protested against the recent wars in Afghanistan, Iraq, Syria and Libya? These also contravene international law, specifically Article 2 of the United Nations Charter signed in June 1945. It is strange to some of us that the pro-migrant activists are only interested in the welfare of the people they call migrants and refugees after they leave their war-torn countries. Why don't they care about them when they were being bombed as citizens of Afghanistan, Iraq, Syria and Libya? What is the “moral” difference between a citizen of Syria and a migrant from Syria? Why ignore a person's fate in their home country and then be outraged by their treatment when they leave? Isn't this hypocricy? If international law had been upheld and these countries not illegally attacked, would there be millions of “refugees” trying to get to the EU?